“Blue brain” –The name of the world’s first virtual brain. That means a machine that can function as human brain. Today scientists are in research to create an artificial brain that can think, response, take decision, and keep anything in memory. The main aim is to upload human brain into machine. So that man can think, take decision without any effort. After the death of the body, the virtual brain will act as the man .So, even after the death of a person we will not loose the knowledge, intelligence, personalities, feelings and memories of that man that can be used for the development of the human society. No one has ever understood the complexity of human brain. It is complex than any circuitry in the world. So, question may arise “Is it really possible to create a human brain?” The answer is “Yes”. Because what ever man has created today always he has followed the nature. When man does not have a device called computer, it was a big question for all .But today it is possible due to the technology. Technology is growing faster than every thing. IBM is now in research to create a virtual brain. It is called “Blue brain “.If possible, this would be the first virtual brain of the world. We can say Virtual brain is an artificial brain, which does not actually the natural brain, but can act as the brain .It can think like brain, take decisions based on the past experience, and response as the natural brain can. 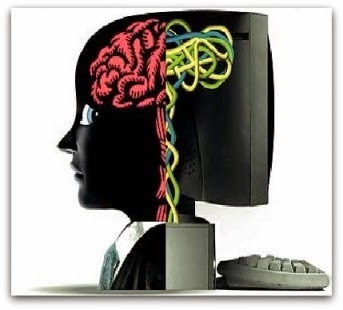 It is possible by using a super computer, with a huge amount of storage capacity, processing power and an interface between the human brain and this artificial one .Through this interface the data stored in the natural brain can be up loaded into the computer .So the brain and the knowledge, intelligence of anyone can be kept and used for ever, even after the death of the person. How the natural brain works? The human ability to feel, interpret and even see is controlled, in computer like calculations, by the magical nervous system. Yes, the nervous system is quite like magic because we can't see it, but its working through electric impulses through your body. When our eyes see something or our hands touch a warm surface, the sensory cells, also known as Neurons, send a message straight to your brain. This action of getting information from your surrounding environment is called sensory input because we are putting things in your brain by way of your senses. Once our brain has interpreted all that we have learned, either by touching, tasting, or using any other sense, then our brain sends a message through neurons to effecter cells, muscle or gland cells, which actually work to perform our requests and act upon our environment. The word motor output is easily remembered if one should think that our putting something out into the environment through the use of a motor, like a muscle which does the work for our body. The uploading is possible by the use of small robots known as the Nanobots .These robots are small enough to travel through out our circulatory system. Traveling into the spine and brain, they will be able to monitor the activity and structure of our central nervous system. They will be able to provide an interface with computers that is as close as our mind can be while we still reside in our biological form. Nanobots could also carefully scan the structure of our brain, providing a complete readout of the connections. This information, when entered into a computer, could then continue to function as us. Thus the data stored in the entire brain will be uploaded into the computer. In conclusion, we will be able to transfer ourselves into computers at some point. Most arguments against this outcome are seemingly easy to circumvent. They are either simple minded, or simply require further time for technology to increase. The only serious threats raised are also overcome as we note the combination of biological and DigitaL technologies.